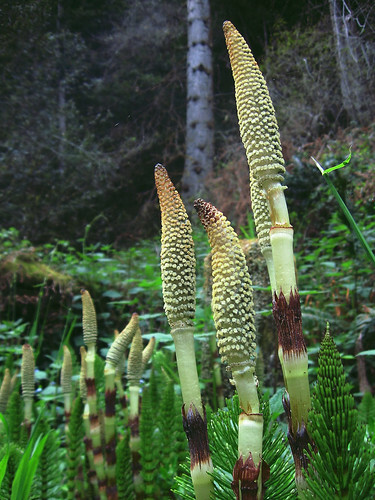 Horsetail comes from a family of large tree-like plants that originated in the Paleozoic era. Today it is found throughout much of North America, Europe, Asia and the Middle East. The plant gets its name from the Latin words equus and seta, meaning "horse" and "bristle," as it looks similar to a horse-tail and has a bristle-like texture. For this reason, it has traditionally been employed by pioneering Americans for scouring pots and polishing metals. 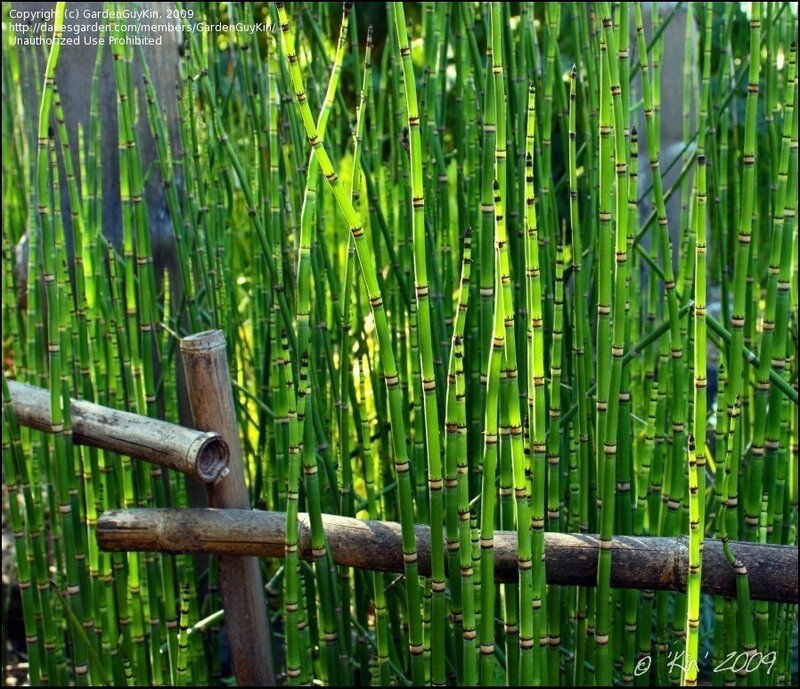 Horsetail was also a commonly-used medicinal herb from both the ancient Roman and Greek cultures. Medicinally, it was employed to strengthen the bones, stop bleeding, heal ulcers and wounds, as well as a remedy for tuberculosis and kidney conditions. Horsetail holds high amounts of the chemical component silicon, a known bone protector and strengthener. For this reason it has been suggested as a treatment for osteoporosis. It is present in medications that lower blood pressure, and is also a known diuretic, which may contribute to its use as a treatment for kidney stones and urinary tract infections. It also helps to strengthen brittle nails, cure mouth ulcers, stop bleeding gums, relieve the pain of a sore throat, and is often used topically as a treatment for minor burns and wounds. 4.5 to 6.5 pH levels, and sand to mostly clay soil. Requires consistently moist soil. Thrives best in half day sun to light shade. Full sun will cause discoloring. 0.5 ft. to 4 ft.
Best to plant seeds or starters in separate containers indoors. Once transplanting outdoors, keep plants in pots, as they can easily over-take an entire garden. Space 3-6 in. (7-15 cm) apart. Grows in U.S. zones 7 to 10, and prefers heat and humidity. Early spring after danger of frost has passed. Easy propagation vegetatively and by dividing spores/rhizomes, tubers or bulbs. Under ideal conditions, proliferation is rapid, and the plant can easily become a nuisance. N/A. This plant does not come to seed. Harvesting occurs in the summer months. Pick individual stems, throwing away an discolored parts. Dry in a cool, dry place. Once dried, the stems can be ground into an herbal powder and stored.